Described by her coach as fiercely competitive, Jazlyn Lopez Serrano has established herself as a key contributor to the Golden Valley Color Guard team in her role as Team Captain. In addition, Jazlyn has a heart for SERVICE making her #BulldogSTRONG. Plans After High School: Jazlyn has been accepted to CSU Bakersfield, CSU Chico, and is on the wait list for Cal Poly Pomona. She wants to major in Business and/or Animal Science as she has aspirations to eventually be a veterinarian and/or possibly open up an animal shelter for displaced animals. What Makes Jazlyn #BulldogSTRONG: As a 6th grader at Ollivier Middle School, Jazlyn Lopez Serrano decided that she would join the school's color guard team because many of her friends were already participating. Little did Jazlyn know, color guard would become her passion for the next seven years of her life. "I absolutely fell in love with color guard," states a passionate Jazlyn, "I enjoy the performing aspect of color guard as it allows me to go to a different place with my emotions. I also enjoy being part of team that has to come together with each performance. When we all work as one, it's a beautiful thing." Jazlyn would finish her middle school career as an active member of the color guard team and with that experience, she knew that she wanted to be part of the Golden Valley Color Guard team, one of the top programs in Kern County, the state of California, and in the nation. Jazlyn would make the color guard team at Golden Valley and in her time, she has been an important part of the team's success the past four years while serving as team captain in her final year. In both her sophomore and senior years, Jazlyn was a key cog in Golden Valley finishing in 1st Place at the Pep and Pageantry Arts Association of Central California (PPAACC) finals defeating power house teams like Stockdale and Arvin in the process. 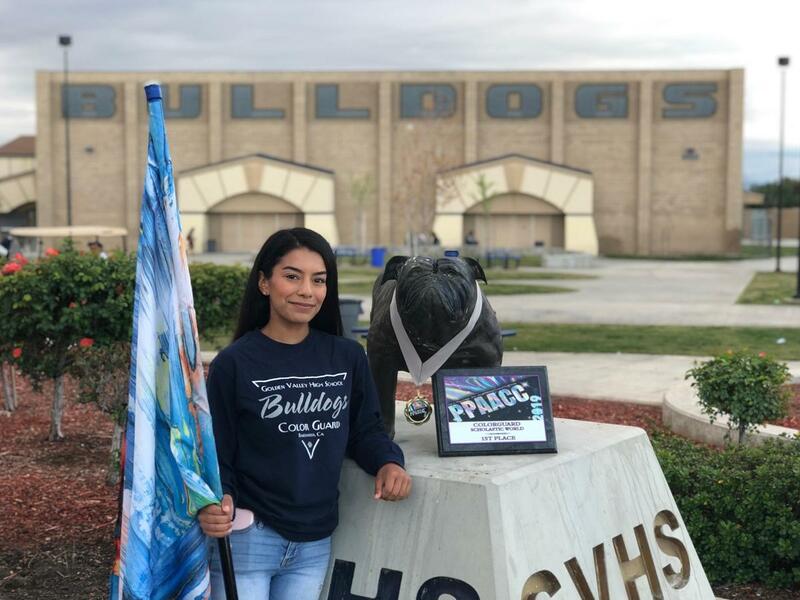 This past fall, Jazlyn helped lead the Bulldogs color guard squad to an undefeated record during field season and twice, Jazlyn has helped Golden Valley complete sweepstakes in which the Bulldogs won every competition they competed in. Perhaps it is Jazlyn's competitive nature that drives her for success and inspires her teammates to perform at high levels. Golden Valley Color Guard Head Coach, Nancy Cisneros, turns to William Shakespeare in her description of Jazlyn, "And though she be but little, she is fierce." Jazlyn Lopez Serrano is a key contributor to the Golden Valley Color Guard team in which she serves as Team Captain. In addition to her efforts in color guard, this year, Jazlyn decided to step out of her comfort zone as she joined the cross country and track and field teams respectively. "I wanted to try something new and I actually enjoy running," laughs Jazlyn. For her efforts, Jazlyn earned the Most Improved Award for cross country, was featured in the Kern High Network's Achieve Magazine during the Fall 2018 issue, and was a Top 10 Finisher in the South Yosemite League Championships. In track and field, Jazlyn runs the 1600 and 800 with personal record times of 6:28 (1600) and 2:57 (800). Jazlyn is a stable and consistent force for the Bulldogs as she gives her best effort each and every day. Beyond her success in athletics, Jazlyn has excelled academically as she has an overall GPA of 3.88 while taking mainly GATE, Honors, and Advanced Placement classes. Jazlyn is committed to being successful in college with the goal of one day becoming a veterinarian and/or possibly opening an animal shelter. Part of Jazlyn's reasoning for this career path is because her family adopted a small dog (terrior mix) named Faith who needed some love. "Faith is such a loving dog," states Jazlyn, "Faith needed some love and we were able to provide it. Because of Faith, my focus is to help animals in any capacity." Because of her PRIDE and commitment to Golden Valley through color guard, cross country, and track and field as well as her desire to SERVE animals in need, Jazlyn is #BulldogSTRONG. The Golden Valley Color Guard team perform "The Consequence of Sound" at a competition in Union City. What #BulldogSTRONG Means to Jazlyn: "Being #BulldogSTRONG means that we should be able to help out anyone and everyone no matter what the situations is. It means taking PRIDE in what you do by giving 100% in your approach. No matter what comes our way in life, we can all be #BulldogSTRONG."